I enjoyed this review of XYZprintings' new 3D pen, that draws physical objects in midair, by a self-described terrible artist. I'm a terrible artist. I get the basic idea of stick figure drawing on a good day, maybe. So it was with a little trepidation that I tried out XYZprinting's 3D Pen, a device that lets you draw stick figures, houses, or anything you can think of, all in 3D. I gave it a try here at CES, and learned that as long as I could abide by the laws of physics, I could do it. 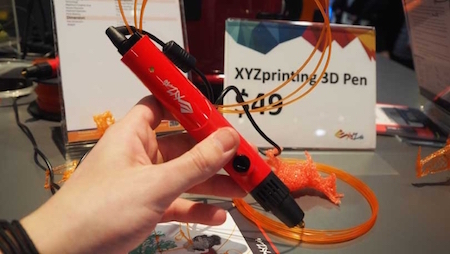 The 3D Pen looks like, well, a red pen with two buttons: Heat and Off. It weighs about as much as a standard ballpoint, except when it's plugged in it feels heavier. Plugging it in, which you have to do to use it, tugs the pen backward a bit, which can be distracting, but you get used to it. CES 2016 Bug ArtBasically, the pen is fed filament ($25 per spool), and when you press the Heat button, the Pen will expend said filament in liquid form, cooling 10 to 20 seconds later, where it will become solid. In my case, the color was orange. The pen looks like it's dribbling when you first press the Heat button, but once you move your hand up or down it stabilizes. You have to start by moving up/down for any 3D picture you're drawing, obviously, so that whatever you draw will have a base. You don't need a computer or any software to use the 3D Pen. The earliest sf reference that I know of for creating a 3D object with a penlike device is from Things Pass By, a 1945 story by Murray Leinster. This device could be controlled to produce useful artifacts from drawings, which might lead to more graceful designs.